Photo: Grant Guise and T- Roy Temple Basin 2007. With a storm hitting the country its a good day for staying inside and writing my first Ski Field review. I thought I'd start with somewhere I know well, which is my local skifield in Arthurs Pass - Temple Basin. You can find out all their info at www.templebasin.co.nz so there is little point in me repeating the info contained there, and I can get right in and give an honest INDEPENDENT review.Please note that as this is my first review, there are no comparisons available yet, so you may feel my ratings are a little unfair in isolation! This should change as subsequent reviews provide greater comparisons. Also, I have a strong tendancy towards backcountry use, so my reviews will probably reflect that a bit. My review is based on my impressions, and are simply my opinion and not a personal criticism of skifield staff. So here goes. Firstly my ratings.10-outstanding 1-extremely poor. 10/10 Backcountry/Mountaineering. Not surprising I guess, but Temple basin is an absolute mecca for 'inbound' backcountry - meaning you can experience the solitude and isolation of the Southern alps, while your safety is assured by the ski patrol. (unless you choose to ignore them! Not reccommended!) Temple basin gives access to Mts Casidy, B'limit and Mt Phipps which are all excellent climbs of lower technical alpine skills (ice axe and crampon use). 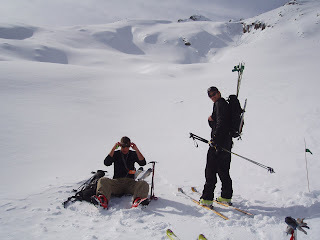 There are often Education courses run on backcountry skills such as Avalanche awareness, mountaineering skills and backcountry skiing clinics.If you are a fit and keen mountaineer than the road will not pose much of an issue. Accommodation is reasonable. At first I thought it was a bit expensive, but then you have to consider a few factors like freight, and running the goods lift, and balancing out good years and bad years. So yeah $60 is reasonable (includes meals).There is potential for greater growth into the Secondary Education sector. Temple basin also has a long association with the University of Canterbury and there is a University lodge on the mountain (of which I know very little, except its probably cheaper for the uni students to stay there). For a backpacker travelling alone temple basin is an excellent place to meet others in a friendly relaxed environment. You can self cater keeping the cost a bit lower and there is a student rate. Ok there are a few factors here to consider. People expecting a 'ski resort' would be well advised to stick to Mt Hutt or Mt Cheeseman even. There you can park on the mountain and virtually ski from your car.You can also sit in the Cafe (cheeseman) and watch your kids playing in the snow. I've met many a bewildered tourist on the track surprised at how far up they had to walk! Gear is another issue here. You probably want the right kit, and often travellers don't have hats gloves and clothing to suit. Last week I met a lovely young lady in a mini skirt with a cigarette hanging out of her mouth! The walk up can take anywhere from about 45min continuous walking, to 2 hours depending on how much you need to stop. Larger groups tend to take longer too. Many of my groups of 30people take over two hours and you need to allow for that time in your day. The group need to stay together and keep an eye on each other. There is potential for harm to anyone wandering away from the track. The time factor may be an issue for travellers wanting a quick fix before they rush off to bungy jump off a stump. I'm assuming mum, Dad and a couple of kids. No! Don't do it! The kids wont appreciate that they were the youngest on the mountain - they just wont like it. The lodge itself is boring for them and it is not an atmosphere geared to younger kids. The cost factor wouldn't be worth it either, plus the lost time in the walk and loading/unloading the goods lift. Yes its a unique experience - something to look forward to when they are a lot older! My suggestion is to go to Porters or Cheeseman, where younger kids are welcome and can ski for free - a lot less stressful. In balance I have seen a few organised families who have planned and prepared for Temple well, and I'm sure those families would rate it a lot higher than my 3/10. The backcountry access under ski patrol advisory is outstanding. You can tour around the basin and ski fresh tracks all day, and not see another group. You can mix up a little climbing and skiing too, so that you have the best of both worlds. Skiable terrain - there is something here for everyone. The majority of runs are intermediate to advanced with tight shutes, and some technical faces. Another major bonus is the crowd factor - as in there just isn't one! There maybe ten others on the hill, rather than avoiding others (like you might at a big commercial field) you actually go looking for people to ski with. This is a major drawcard for anyone who has had a gutsfull of lines and crowded cafes - at temple you simply head into the lodge and make yourself a coffee. Once in the lodge you are warm relaxed and comfortable in your own little mountain world - Really easy to relax and forget the stresses of everyday life. The lodge is friendly and relaxed with good hearty food. The staff all have to work as a team to live and survive in their unique environment so there is often a bit of friendly banter going on. There is also the club factor, those really keen can join and extend their involvement longer term if desired. The downside is that there is the occasional club member who views customers as intruders, which is their problem. One final, but critical factor is weather. Temple basin, as with all alpine fields has its fair share of bad weather. However the basin is located in a North Westerly facing basin, so often can be quite good in a Southerly, while everywhere elese in the Cragieburn range is pouring with rain Temple Basin can be lovely and sunny, so it defenetly pays to check whats happening with the weather. I've had some famtastic 'rainy' days at Temple, and I think if you live in an environment that get seven metres of rain a year- you just have to get out and do it anyway. Temple is all natural - which means no on piste skiing. You generally need to be of higher ability and fitness to ski the variable conditions than can exhist. When its good its great, but equally when its crusty, and you've committed your time to Temple you need to develop other interests apart from skiing. Also some years are good and some aren't and Temple may not even open for the season. Another factor is the rope tows. Not my favourite way to get up the mountain in my opinion! I'm always worried about pulling the ropes off and getting my fingers and poles caught in them - something I frequently do when useing them! To me an adult lift ticket for $60 is too much for a rope tow. Obviously the walk has its downside too, limiting for people with mobility issues etc.Walking down again dosen't take long, but can be pretty hazardus when icy. It is often a good idea to take your time and carry a headtorch and ski poles if attempting the road later in the day. Temple Basin is on Conservation land. Every year they have to get a concession to operate there forcing them to work within DoC boundaries. The 'road' itself is not really considered to be a road, but gets used every year. Run off on the road has created some minor erosion in the area. The toilets are on septic tanks, so there is no water contamination. In general environmental impact is minimal, and besides what would the keas do if there was no Temple Lodge??? Perhaps the ugly are the ill informed who attempt the road ill-prepared,and go expecting 'something else' and are surprised not to find a french style resort village at the basin. However for the ski mountaineer, temple basin is their Shangriela! So thats my first Ski Field Review. I welcome comments, and I hope people find it useful???? Please let me know.